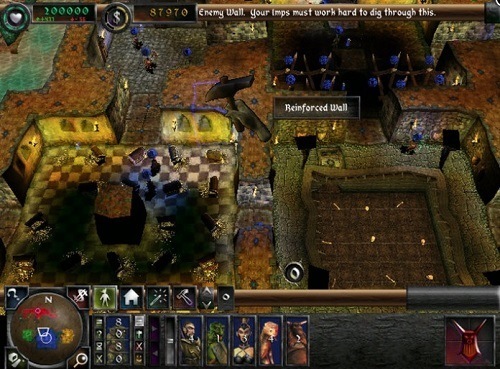 With many of improvements over the original Dungeon Keeper the game saw really good success that stayed true to the dark style of the original while still innovating on the experience. Most notable improvements were in the graphical department that take the game from the simple sprites of the first experience into 3D models. 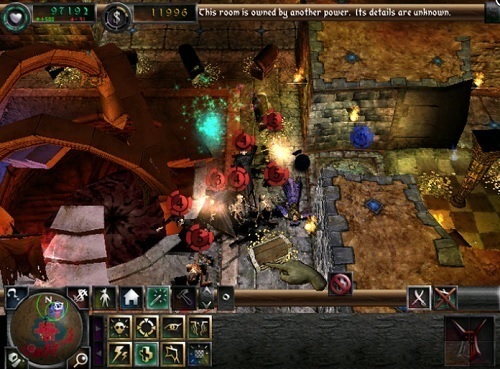 Dungeon Keeper 2 also brought with it a large range of usability improvements that help reduce the games overall difficulty and make it more enjoyable for newcomers to the franchise. This included a dungeon heart that is capable of holding a starting stockpile of gold, a mana system for spells, imps gaining levels naturally and many other tweaks. Just like the original your job is to venture from map to map defeating the hero or other foe that holds the portal gem for that scenario. In order to achieve this objective players need to attract creatures to fill their dungeon by building rooms that they enjoy. You’ll attract Warlocks from the library for example while Trolls will be attracted by the workshop. In addition to creatures players have a large selection of traps to use for defence which are all very deadly and can play an important role in your strategy for that level. The same dark narrator also returns to the game and will constantly call you out in tongue and cheek fashion. It’s got plenty of dark one liners that you’ll be quoting after you’ve finished the game. While the campaign is definitely where the game shined players can also enjoy a skirmish mode, multiplayer and a sandbox pet dungeon option that gives you all the tools and a large map to create a dream dungeon design. Long-time fans and new dungeon keepers alike will enjoy the step back into the dark world of Dungeon Keeper. The second game in the successful Dungeon Keeper franchise. Combines god and management gameplay. Build up your perfect dungeon in the pet dungeon game mode. Lengthy campaign with great variety to enjoy. Get this classic game through GOG.